If you’re looking to grow a Great Pumpkin of your very own, look no further than our Jack O’Lantern heirloom seeds! This variety produces plump, delicious pumpkins with a classic, perfect-for-carving Halloween look. Pumpkins are not hard to grow if you have a long, hot growing season and plenty of space. They require a lot of careful watering (no splashing) and feeding as we advise below. For evenly-rounded fruit, we recommend gently turning them during growth, taking care not to disturb their roots or vines which are quite delicate. For optimum growth and yield, it’s helpful to train the vines to grow straight and in the direction you want. If you’re aiming to grow that award-winning great pumpkin, you will need to limit the number of pumpkins you allow to grow on each vine, by pruning the extra blossoms. Pumpkin—Cucurbita pepo—is an annual fruit and a member of the huge Cucurbitaceae family. Other members of this family include watermelons and squash, among many others. The word pumpkin comes from the Greek word pepon which means ‘large melon’. Pumpkins, similar to their close cousin, squash, are thought to have originated in North America. Pumpkin seeds dating back to 7000 – 5500 B.C. were discovered Mexico, and there are many references to pumpkins going back many centuries. Known as calabaza in Mexico, pumpkin has long been a common ingredient in Mexican cuisine, along with corn, beans and chilies. It’s a key ingredient in well-known dishes such as moles and tamales and is ubiquitous in many other regional dishes. Grilled and salted seeds—called pepitas—are also enormously popular. However, calabaza doesn’t bear much resemblance to our big, bright orange Jack O’Lantern variety: they are different colors, mostly smaller, and irregularly shaped. Keep soil evenly moist, but not soaked. When watering avoid wetting the foliage—using a soaker hose is best. Pumpkins like rich, well-drained soil. Soil temperature must be above 65-70°F for seeds to germinate; optimum soil temperature is 95°F. . Direct sow outside in spring once the threat of frost has passed, unless your growing season is super short, in which case, sow indoors in peat pots 2-4 weeks before the last frost. Direct sow seeds about 1″ deep outside. Planting in mounds of soil or raised beds ensures good drainage and warmer soil. Be sure to rotate crops every couple of years. Pumpkins are heavy feeders (something’s got to fuel all that growth!) Feed them with regular application of aged manure or rich compost. In addition, apply organic fertilizer on a regular basis. Use a nitrogen-heavy formula when the plants are about a foot tall and the vines start to sprawl. Later, just before flowering, switch to a phosphorus-heavy formula. Apply a thick layer of organic mulch (compost is ideal) shortly after the seedlings appear. Foliar diseases, including various types of mildew are common but can be minimized through careful watering (don’t splash the leaves). Pumpkin plants are also susceptible to various types of rot and blight that originate from spores in the soil which is a big reason to rotate your crops (don’t plant pumpkins in the same bed for more than two years in a row). Pumpkin vines are very delicate and must be treated with care. See Harvest notes below. Beans, cantaloupe, corn, dill, marigolds, nasturtium, squash. Don’t plant them with potatoes. Yes. Use a big pot (at least 5 gallon). You’ll need space to allow the vines to sprawl. Timing your pumpkin crops’ harvest can be a bit tricky, depending on what part of the country you live in. Pumpkins take a long time to grow and they don’t tolerate frost. That can be a challenging combination in northern parts of the country where the growing season is short with frost may occur weeks before Halloween. The good news is that, handled properly and left intact, pumpkins will last for awhile after being picked. As you approach harvest time, in general, it’s best to leave the fruit on the vine as long as possible. You will know when your pumpkins are ripe from their size and color. Some gardeners recommend placing boards under the ripening fruit to protect it from pests and standing moisture. When it comes time to separate a pumpkin from the vine, use a sharp knife to make a clean cut without damaging the vine. Don’t carry the pumpkin by the stem; cradle it from its base. 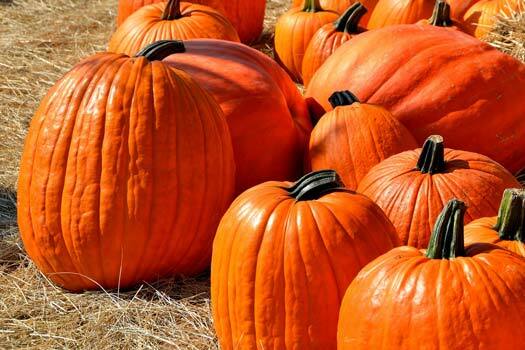 It’s helpful to wash pumpkins after harvest to remove organic material or bacteria that may cause them to rot. Store them in a cool, dry, dark place. Our heirloom seed variety—Jack O’ Lantern—develops into classic round/oblong pumpkin plants perfect for carving super spooky halloween faces. Also delicious for cooking, especially pumpkin pie!. Roasted seeds are tasty too. These pumpkin plants produce fruit that typically weighs 18-24 pounds; they need a lot of room to grow! These are slow-growing plants that can be harvested in late summer/early fall and stored in a cool place until close to Halloween. Pumpkins are a nutrient rich food. In addition to being low in calories and high in fiber, they’re a wonderful source of beta carotene, a powerful antioxidant.